For anyone driving up Sunday to fly fish the Gunpowder River, the crossroads we all know as Hereford is having a 4th of July parade. The parade will start at the Hereford Pharmacy Shopping Center on Mt. Carmel Rd. and finish at Hereford High School on York Rd. A fireworks show will top the parade off at dusk. If you’re just passing through, expect road closures as early as 4:00 PM at York, Monkton and Mt.Carmel roads. Fishing Masemore or the Falls Rd stretch, (West of I-83 in the upper catch and release section) Sunday afternoon or the Lower river from Upper Glencoe Rd. through Sparks Rd. access will keep you from experiencing traffic woes. This entry was posted in news on June 29, 2007 by Theaux Le Gardeur. The river is flowing at 34 Cfs and is low and clear. Water temp is a chilly 53 at Falls Rd this morning. We had lots of reports yesterday from anglers that picked up fish from Masemore through the Falls Rd. stretch on flying ants early, caddis in the #18-20 range midday and beetle and small hopper patterns in sizes #12-10 by afternoon. Blue Winged Olives are showing up in the #18-22 range above Bunkerhill Rd. Small streamers continue to produce throughout the catch and release area. 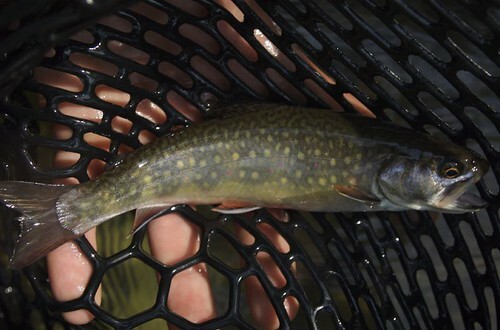 During the Summer months, when freestones creeks and smaller tributaries are warming, the cold, clear and stable flows from Pretty Boy Reservoir allow Native Brook trout, Wild Brown trout, and Kamloops rainbows to provide anglers from a five state area a much needed escape. Cloudy days along the Gunpowder river in the Hereford area of Gunpowder State Park provide some of the best fly fishing the state of Maryland has to offer. This entry was posted in fishing report on June 28, 2007 by Theaux Le Gardeur. Backwater Angler has partnered with Mary K. Jenkins, aka. The Fish Lady, to bring you pre-shrunk, 100% cotton, T-Shirts now available in three styles.The shirts feature a vibrant screen print high across the back, and the Backwater Angler logo printed on the right front chest. These shirts are available in sizes small through XXL and are limited in quantity. This entry was posted in gear on June 26, 2007 by Theaux Le Gardeur. The gate change occurred today . The Gunpowder river water is now being pulled from the 55 ft Gate. Base flow out of the dam is 48.6 F so by the time this water reaches Falls Rd in the uppermost catch and release area of the Gunpowder river the water temperature is 51 F by midday. The river temperature at York Rd. this afternoon was 54 F. Flow is now 32-34 Cfs. -Think shin deep to knee deep throughout the upper river. Caddis and Sulphurs are still coming off and flying ants, Japanese beetles and hoppers are shrieking as they hit the cold water. More water, downstream of the confluence of Little Falls, and some rather large fish have been reported in the stretch from Bluemount through Upper Glencoe Rd. This entry was posted in fishing report on June 26, 2007 by Theaux Le Gardeur. Please Join us Thursday evening, July 5, 2007 from 6:00 PM till 8:00 PM for an entomology clinic along the Gunpowder River. Brush up on insect identification, biology and matching the hatch with a variety of techniques. Cost is $75 per person and participants provide their own gear. Class size is limited to 4 and pre-registration is required. Please give us a call at 410-329-6821 or drop us a line at info@backwaterangler.com to pre-register. This entry was posted in events on June 25, 2007 by Theaux Le Gardeur. The Gunpowder river is flowing at 74 Cfs, is 61 F and is clear. Today we’ve heard from several anglers that are still finding Sulpurs in the morning followed by caddis and even a few blue winged olives midday. Most of these dries are in the #18-22 range. Ants and beetles are also part of the morning mix with hoppers and larger terrestrials accounting for fish during the late afternoon hours. It’s certainly hot enough for a spinner fall, so consider fishing emergers, cripples and para-spinners towards dusk till dark. Don’t leave home without 7x tippet. Thanks to Caleb Reinhold, Matt Stephens, & Michael Mass for the following stream reports. Last Sunday (the 17th), I came up with three if my friends and they all rented gear, Theaux might remember us. Anyway, I just wanted to let you know that we too saw a watersnake (black with gray stripes, if my memory serves me right) latched onto a good sized rainbow. We saw it near the second bend from the dam, where there is a small little pool on the far side of the bend and several fallen trees. I just thought you might like to know that we too saw the same thing on the same day. It sure was a crazy sight. Fished with a friend yesterday, (6/21). Man is the water low! Still perfectly fishable though and water temps felt good. Fished from 2:30 until 7:30 and didn’t see a hatch to speak of. 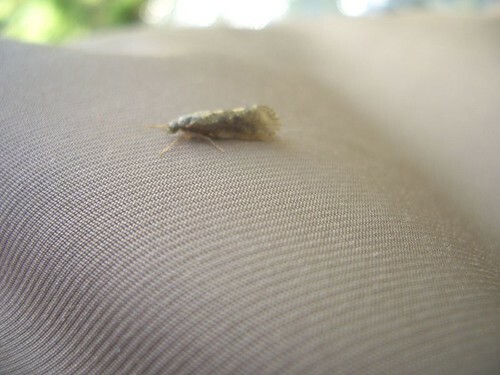 Saw 3 pale sulfurs and a couple darker mayflies. Any ideas what they are? Some occasional risers but nothing major. Landed a brookie about 40 yards up from the Masemore bridge where the feeder creek comes in. When are they going to release some freakin’ water?? No luck with the unweighted nymph, but caught several with a large black ant — including a chunky 12-incher. No hatches were coming off, but the fish seemed to be looking to the surface for most of the afternoon. I saw at least three go after insects flying over the water. After seven or so the ant stopped producing and I switched to a small caddis. The caddis worked well until a little after 8. This entry was posted in fishing report on June 25, 2007 by Theaux Le Gardeur. 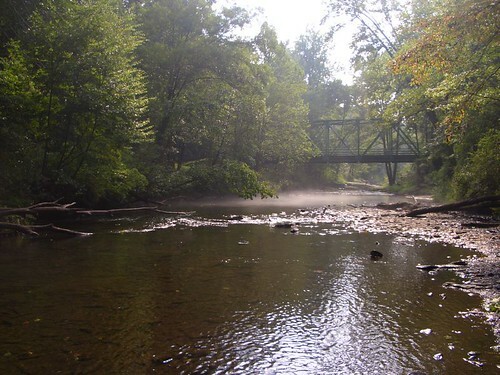 In this Fly Fishing Maryland segment, Jason du Pont describes fly fishing the lower Gunpowder River. Jeff Lewatowski catches a nice smallmouth bass on a fly and Matt Devlin from Annapolis , Maryland releases a nice rainbow trout. This entry was posted in news on June 25, 2007 by Theaux Le Gardeur. 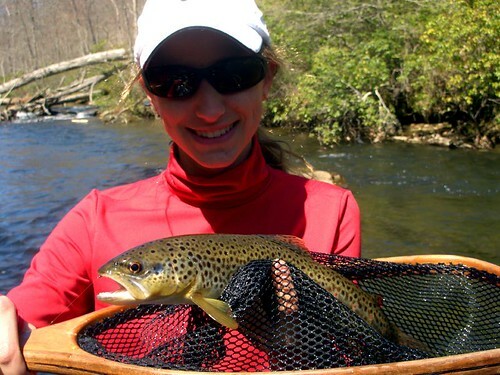 Fly fish the Savage River and the North Branch of the Potomac River with a Maryland Licensed Guide on July 25-26. During your Backwater Angler Overnighter, you’ll enjoy a day and a half of guided fly fishing in Western Maryland, an overnight stay in a stream side cabin and have three meals on us for $550 per person. Interested? Book your Backwater Angler Overnighter early. Please give us a call at 410-329-6821 or drop us a line at info@backwaterangler.com to pre-register. This entry was posted in events on June 22, 2007 by Theaux Le Gardeur. If you live, work or are visiting downtown Baltimore, consider this post a friendly reminder that you are only 35 minutes South of the Gunpowder, river, a stream that was rated in 2006 by Field and Stream magazine as a top 5 Tailwater stream. In fact the Gunpowder was just recently listed in Field and Stream Magazines’ top 150 Fishing spots. Today the Gunpowder river is flowing at 71 Cfs and the water temp is 61 F at Falls Rd. Small Sulphurs in the #18-20 range have been coming of sporadically, but most of the fish are keying in on caddis in the #16-18 range. Blue Winged Olive emergers are worth a shot, especially as passing thundershowers cloud the skies up. Ants , Beetles and small grasshoppers are also accounting for quite a few fish in the catch and release section. the lower river below Bluemount Rd. is full of gizzard shad fry so bring a few unweighted streamers with you next time you’re up. With a gate change in the works the flow will be slowing down, ( between 34- 45 Cfs) and cooling down a bit, (44-48 F) in the next 24 hours so this weekend, plan on fishing mid-to late afternoons unless you’re a dedicated nymph fisherman. 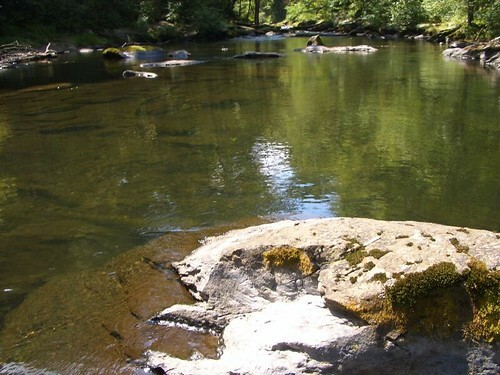 as of this morning water levels are still in the 74 Cfs range, water temps are 51-58, and the water is clear. This entry was posted in fishing report on June 21, 2007 by Theaux Le Gardeur. This video short highlighted the efforts of Theaux Le Gardeur, and Jeff Lewatowski during the Gunpowder river cleanup. Thanks to Cliff Callendar, from Reston, Va and Matt Mcgee from Parkton, MD for lending a hand. We found 4 tires, and filled 25 bags of garbage-not bad for a mornings’ work. Thanks to Americanrivers.org for providing bags and support for the cleanup. During the cleanup, Cliff and Matt found a water snake latched on to a 9 inch brown trout, the subject of an upcoming video-stay tuned.We still have plenty of bags left so next time you’re up, stop by and grab one and do a little cleaning as you fly fish one of the prettiest, and productive rivers in the Mid-Atlantic region. This entry was posted in video on June 21, 2007 by Theaux Le Gardeur.